If a person were to say that Kansas football can't compare to essentially the motherland of the sport, most high school football fans would say they're stating the obvious. Massive stadiums funded privately for the sake of a sport are common place. High schools like those in Allen, TX and Corpus Christi, have been able to call stadiums with capacities of 18,000 people home. However, it's considered normal for powerhouse schools to have the biggest, nicest amenities. What would a lesser known program bring to the table compared to some of the biggest venues in the entire state of Kansas...? Driving up to the stadium was an unreal experience for me when it came to a high school game. The Waxahachie Indians were opening their new season against the Lakeview Centennial Patriots, a middling 6A team hoping for a return trip to the playoffs after going 8-4 last year. Waxahachie had a rougher go of things, losing the final four games of the season and missing the playoffs with a 6-4 record. Neither team has any true rivalry or anything significant to play for aside from fixing any issues before district play begins. Despite the low stakes involved in the game, even the biggest rivalry games such as Lawrence-Free State and ONHS-OSHS couldn't absolutely pack a parking lot over an hour before game time like how I witnessed that Friday night. Arriving in town through the highway, I was thinking about what I should do before actually going to the stadium since I had arrived earlier than expected with over an hour before game time. 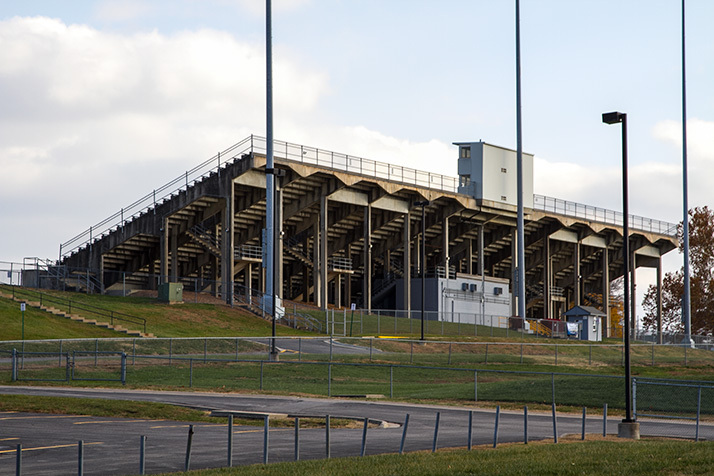 Those thoughts were squashed quickly when I noticed a long stretch of vehicles lining the service road for almost half a mile, all leading to the main entrance of Lumpkin Stadium. Pulling up to the complex, the sheer size of the structure kept me staring throughout my entire wait to park (Multiple parking attendants were lined up to speed up the process). The approach to the the ticket booth felt more like I was attending a DII college game that would cost me at least $50 for a good seat; not the $8 I paid for a reserved spot at the 50-yard line. 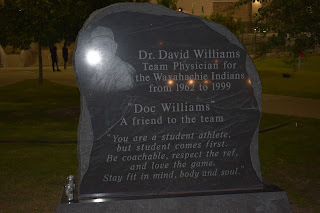 Sitting on opposite sides of the giant painted brick "W" at the base of the stairs were two engraved memorials to the lone championship team of 1992 and longtime team physician Dr. David Williams. Fortunately, I was able to get in just in time to get a look around before players entered the field. The main thing that caught my eye after the sheer size of the almost packed stands was a large statue of the Indian mascot for the school. The statue towered over the faculty workers as they prepared for kickoff, but it's size was nothing compared to the large jumbotron display that stood nearby. (Seemingly) Professional highlight reels mixed with the team's local radio broadcast showed a level of production that again, seemed more fitting for a mid-level college instead of a simple high school in the middle of Texas. Before I knew it, the game had begun. Waxahachie quickly showed it's power over the small Lakeview squad, stuffing the Patriots on their opening drive and returning the punt for the first touchdown of many on the night. With every score, you could almost feel the concrete floors vibrate as the crowd went wild. The cheers didn't die even as the game slowly devolved into a routine blowout, as the Patriots couldn't keep up for more than a quarter before falling apart defensively in a 63-24 loss. On my way outside of the stadium, I took another look at the main structure and noticed the team store. Not a simple set of tables with shirts,, but an actual section of the building designed specifically to sell Indian merchandise. It isn't pretty, it isn't new, it isn't even particularly nice. However, it has a surprisingly large capacity. So surprising that I almost used O.D.A.C as the main Kansas representative before double checking other fields in the league. I've seen plenty of games at this place from both the field and the stands. After all these years, the best way I could describe it is that it does what it's designed to do. People can fit in it. There really isn't anything else to it. With a tiny, cramped press box and plain, steel benches lining both sides, spectators go into each week hoping a good game will distract them from the pain in their rear-end caused by the cheap seating. 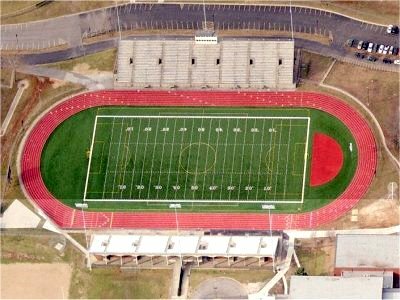 Other stadiums have fancier designs like both Lawrence schools, but their stadiums' fancy stonework comes at the cost of overall capacity with Lawrence High Stadium barely cracking the 4,000 mark and Free State holding even less at around 3,500. While all SFL fanbases are capable of filling out their home stands, it is rare to actually approach capacity like what I saw during the opener in Texas. It was obvious that the football program of Waxahachie was far more ingrained in the town's culture than what you can find anywhere in most of Eastern Kansas. Senior citizens packed the center handicap section, with people unrelated to any players or the program itself coming together for the sake of supporting the team and by extension, the town itself. Students only filled out roughly 1/8 of the home stands and parents largely occupying the reserved seats, special fold up chairs similar to those found in Arrowhead Stadium. I'm aware that this part of the story has somewhat reverted back to Texas again, but that's mainly due to how incredibly different football is in this part of the country. It was never a question about whether or not Kansas was better than Texas. It was about the questions revolving around where Kansas football stands on a national level. After looking at where we stand compared to the very top of the ladder, it's a wonder if &nbsp;football here will ever reach the kind of level where it isn't considered a phenomenon for a team to be ranked in the Top 100 on sites like MaxPreps (Bishop Miege opened the 2017 season at #77). Unless larger schools find a way to bring in more interest and more money, such ideas are mere pipe dreams.